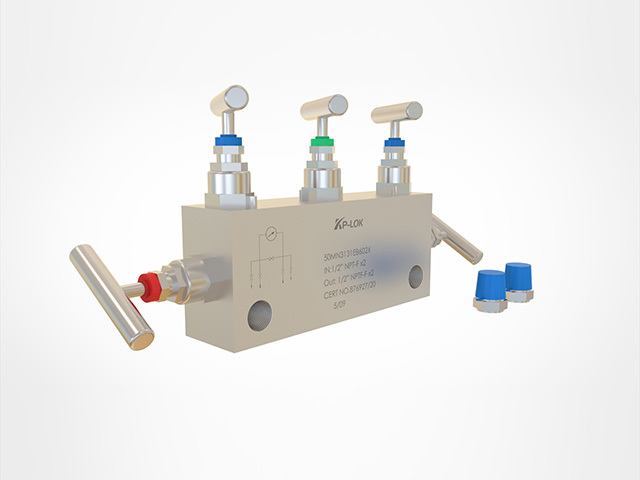 Instrument manifold, manifold valve - Kp-Lok Houston Inc. Please make a section from our top-performance needle valves in various materials or our range of rugged instrument manifold valves. Manifold valves are manual bleed and block manifold valves for force instruments. Suited to control, water, oil, chemicals, toxic fluids, steam, and air. Flanged models are designed to mount to an industrial differential force transmitter. Applications contain nuclear power stations, oil refineries, petrochemical processing and more. Are designed for static force, liquid level, and differential force applications. Have a body material choices such as carbon steel, stainless steel and duplex stainless and packing material such as PTFE. The flow via a Swagelok manifold is managed by a series of stainless steel needle values. Each valve has a specific work – to block force, to bleed off force, or to equalize force – depending on its place on the manifold. The management of all these works is shared by 2 needle designs – a big cap needle valve for manifold orifices of 0.156 in and a little-bonnet valve for a manifold orifices of 0.125 in. on both designs, the stem packing is very adjustable in the open place, PTFE is the quality packing material, non-compulsory Grafoil packing is accessible for top-temperature applications. These manifold are accessible in compact and traditional body designs. Manifold connections contain female Swagelok tube fittings, pipe ends, and flanges in 1/2 and 3/4 in. and twelve mm sizes. Remote mounting with female Swagelok tube fitting with NPT links.